An in-depth course to give you the knowledge and expertise you need to make money as an online copywriter. Writing Rituals - Banish Writer's Block & Procrastination. Goal Setting Rituals for Freelance Writers & Copywriters. People who set goals earn up to TEN TIMES as much as those who don't. 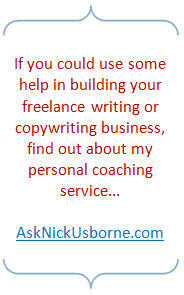 Copyright FreelanceWritingSuccess.com. All Rights Reserved.